WWE's Slam City is out now on DVD, available from www.wwedvd.co.uk. The DVD contains the first 26 episodes of the stop-motion cartoon series, that see's WWE's wrestlers struggling to adjust to life after WWE. Expect appearances (of the likenesses) of top WWE superstars, including CM Punk, Steve Austin, The Rock, Daniel Bryan, Kane and more. How do I even begin to review Slam City? 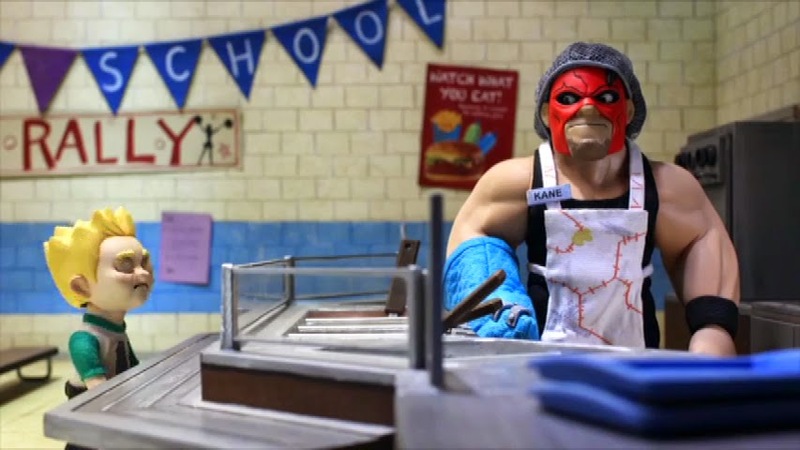 WWE's foray into stop-motion animation see's the evil Finisher take control of the WWE and send all the wrestlers out to get day jobs. So, John Cena becomes a mechanic, Alberto Del Rio becomes a barista, Kane becomes a diner lady and such other exciting things. Whilst it's clear that the main premise of the series is to sell more toys (strangely the DVD has a 12 certificate) that doesn't stop this cartoon from being an entertaining series on it's own merit. The characters are well put together and it's easy to tell which WWE superstar most of them are supposed to be (with the exception of The Miz, who looks like a generic guy in a suit), which is handy, because none of the characters are voiced by the wrestlers themselves. At first this is a little annoying, as the voice actors don't seemed to have even attempted an impersonation of the people they are playing, but you soon become used to each characters new voice and by the end it's really not a problem at all. Some of the early scenes are a little tiresome, as each characters situation is set up and explained, but as the series progresses their is some well-scripted stories, some good dialogue and a plethora of visual jokes. This combination allows the show to work on two levels, as I can see children enjoying a lot of the visuals, whilst parents aren't completely left out with some humurous dialogue along the way. An episode with Daniel Bryan and Randy Orton was a particular favourite of mine. As well as the self contained episodes, there's a few story arcs that can be followed throughout the series. Sheamus and Brock Lesnar's cinema duel, Mark Henry and The Rock's battle over a pizza and the story of The Finisher that's woven nicely throughout. These stories work well to add a little depth to the product and give the viewer a reason to continue to watch more episodes to see how the stories pan out. These stories can also be watched seperately in the Special Features section, which is a nice touch. A "Making of..." documentary can also be found in the Special Features, which gives a deeper understanding of the effort that goes into producing the animation for the show, not just in creating the movements, but also in post-production. There's also an insight into the producers inspirations when creating the series, which certainly upped my appreciation of their work. Unfortunately, the documentary ends with an out and out advert for the toys, which cheapens the over piece. 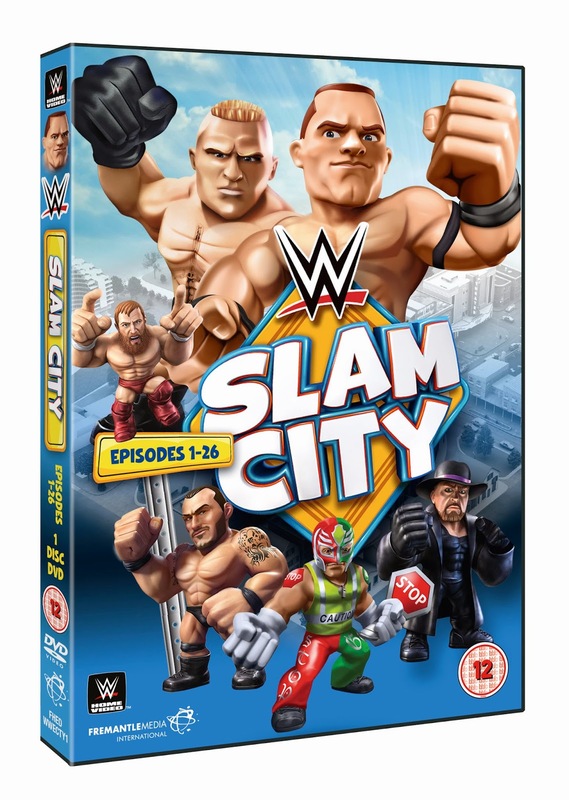 As much as I enjoyed Slam City, it's difficult to reccomend this DVD, when the episodes are so readily available elsewhere, both on Slam City's website and on the WWE Network. It could work nicely as a stocking filler for any WWE obsessed kids out there, but if you're an adult looking for a few WWE-themed chuckles, just head to website and cherry pick the best episodes.